Sergio Lozano is the man to thank for giving us the Air Max 95, and for spring/summer Nike will be delivery several new color options. Dressed in a Midnight Navy, Laser Orange, and White color scheme. This Nike Air Max 95 features a White mesh upper with Grey and Navy Blue leather on the side panels. A fading dot pattern on the panels, Laser Orange accents atop a White midsole and Black outsole completes the design. 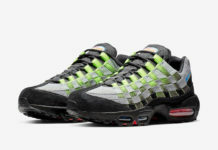 Grab a look at the official photos below, and expect this Air Max 95 to release in the coming weeks at select retailers and Nike.com. The retail price tag is set at $160 USD.